In 1989, when JamieSue Goodman was a high school freshman in Manning, South Carolina — population 4,000 — her journalism teacher got a grant to buy a computer. The idea was to use it to lay out the school paper. But desktop publishing was new, and the teacher didn’t have a technical background. And so the whole experience turned into an adventure in discovering the machine’s capabilities. Fast-forward to 2019. Schools are full of computers, be they Macs, Windows PCs, Chromebooks, or iPads. However, a modern version of the situation Goodman encountered 30 years ago persists. Even gifted teachers aren’t necessarily prepared to guide students through using technology to accomplish real-world tasks. Goodman didn’t set out to make education her life’s work. After majoring in English at the University of South Carolina, she pursued a career in computers and ended up in New York, where she worked on software for Zagat, the publisher of restaurant guides. 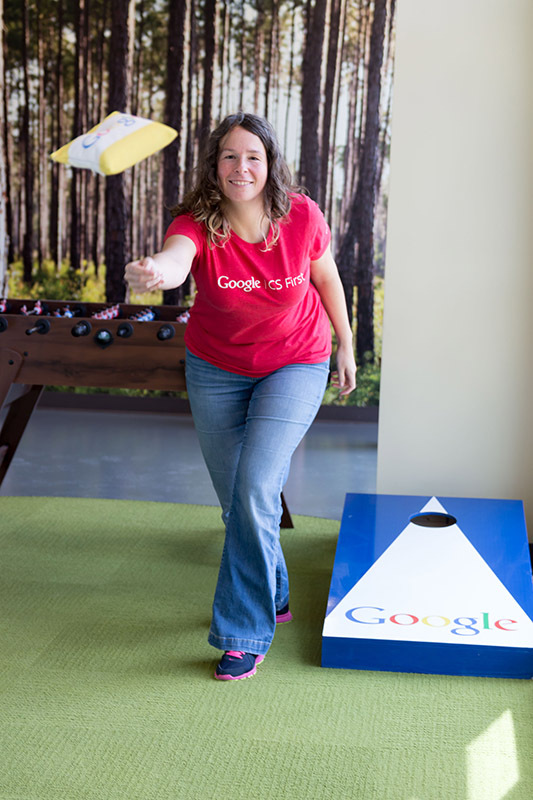 When Google acquired Zagat in 2011, she became a Googler, eventually returning to South Carolina to work out of a company data center near Charleston. A self-taught technologist and daughter of a fourth-grade teacher, Goodman found that she had a yen to give other people the kind of education that had taken her far beyond her small-town roots. “I wanted to teach students about digital skills through applying those skills to building awesome things,” she explains. Given that she worked at Google, which reaches 80 million people with its G Suite for Education and 40 million students and teachers with the Google Classroom class management service, she had the opportunity to satisfy that desire in a big way. Along with Google colleagues, she created an initial curriculum, CS First, and field-tested it in South Carolina schools. Following Goodman’s “awesome project” philosophy, it’s organized into activities that kids care about: A collection of athletic-themed lessons, for instance, includes such tasks as recording sports commentary, making a commercial for a fitness gadget, and programming an extreme-sports game. After launching CS First in 2014, Goodman and her colleagues went on to develop the Applied Digital Skills curriculum, which debuted for the 2017-18 school year. Its broader scope helps students prepare for life beyond the classroom, showing them how to create a résumé in Google Docs, organize college information in Google Sheets, assemble a presentation in Google Slides, and even analyze data to predict hit movies. Applied Digital Skills includes more than 90 hours of video as well as supplemental materials such as instructor guides and a dashboard that lets teachers monitor each student’s progress. Projects range from 45 minutes to 10 hours in completion time; most are aimed at middle and high school students, but some are appropriate for late elementary school students and adult learners. Since it launched, 360,000 students — both K-12 and adult learners — have used the materials, and 50,000 teachers have registered. Google isn’t the only technology provider with free curriculum materials that can help schools get the most out of its products: Apple, for instance, offers “Everyone Can Code” and “Everyone Can Create” lessons centered on the iPad and Mac. Applied Digital Skills immerses students in Google tools such as Docs and Spreadsheets, but Goodman says that it isn’t part of a hard sell to get schools to choose Chromebooks over competitive devices. Everything is equally applicable to classrooms with Windows PCs or Macs. 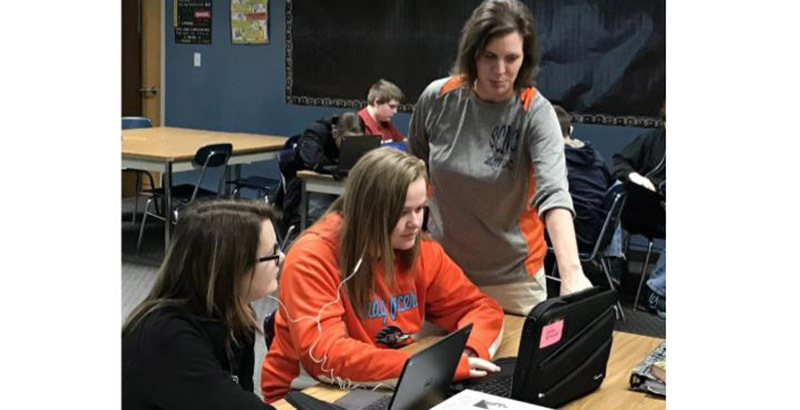 For Alford, Applied Digital Skills is in part about the four Cs that will boost her students’ prospects when they enter the job market: critical thinking, communication, collaboration, and creativity. But she says that there’s a fifth C where it might be most valuable: confidence. She recounts a recent moment in her class as students tackled an Applied Digital Skills lesson involving creating an interactive guide to a local area. The project required some coding, which left one girl fumbling a bit and looking frustrated. And then she figured it out. Such moments aren’t just epiphanies for Alford’s seventh-graders; they’ve also led her to reassess how she teaches even when she’s not using Google’s materials. “This is how students learn now, not like 20 or 30 years ago, sitting in the rows with a pencil and a worksheet,” she says. In other words, Alford is learning alongside her kids, connecting the dots back to when Goodman and her journalism teacher unlocked the potential of her school’s PC 30 years ago. That shared odyssey — as much as any specific skill — is why Google’s curriculum can be such powerful stuff. Harry McCracken, technology editor at Fast Company, has written about computers since the glory days of the Apple II.